YB Plumbing, your professional Houston plumbers, can handle most any plumbing project. Our contractors have experience performing home plumbing repairs, installations, new construction, and troubleshooting in any Residential or Commercial environment. When you choose the services of YB Plumbing you can be confident knowing you will receive one of the best plumbing repair contractors available in the Houston area. Not only are we able to offer most plumbing repairs for homeowners, but we also offer amazing guarantees for our work. Don’t hesitate to call us with any problem, from a leaky pipe to installing complete bathroom plumbing for a new home! 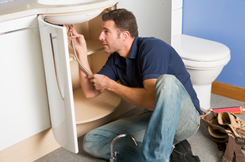 Our Houston plumbers are experienced and they stay current on the latest advances in plumbing technology. From simple faucet repairs to complex sewer troubles, your plumbing is safe with us. New plumbing for kitchen, bath, lawn sprinkler system, etc. f you are looking for plumbing repairs in Houston, then call us today at 713-504-3217 complete our online service request.